Sometimes on lazy Sundays, I really love walking up through Union Square and wandering through ABC Carpet & Home, which has kitchen supplies, decor, carpets, furniture, everything you’d need to decorate your dream home if you had no budget. Yes, the goods can get insanely expensive but the presentations always looks so goddamn gorgeous that I can’t help fantasizing about buying up all of their ceramics, objets d’art and wall decor. 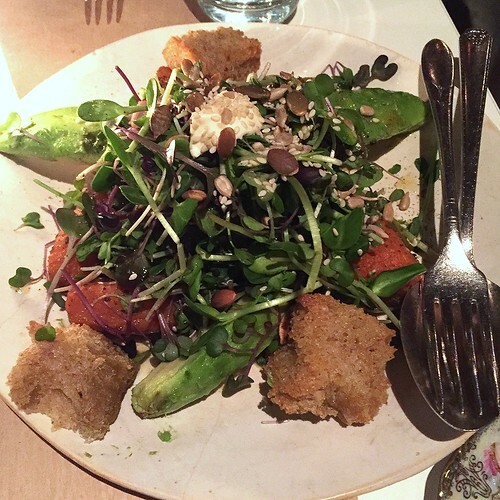 The store is also wonderful because of the well-known farm-to-table restaurant next door by Jean-Georges Vongerichten, which is beautifully appointed with ABC Carpet & Home wares and offers a lot of vegetable-heavy dishes. It’s usually difficult to get reservations on short notice, but one night, Alice and I managed to get a table and dig into some of the lighter fare they had to offer. 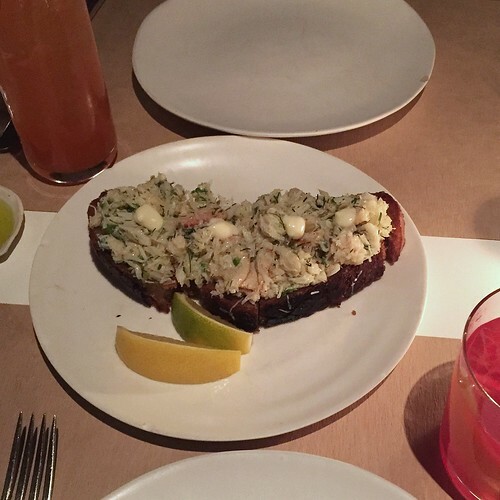 Crab toast with lemon aioli with blood orange negroni and clementine mojito. A nice start that was a surprisingly large portion. One of my favorite dishes from last time: roast carrot and avocado salad with seeds, sour cream and citrus. It may look like a mess of greens but it’s incredibly flavorful and full of different textures – crunchy seeds and croutons, smooth and creamy avocado, toothsome carrots spiced with cumin. Good for you but delicious too! I’ve tried to replicate this dish at home but there’s always something missing in my version. 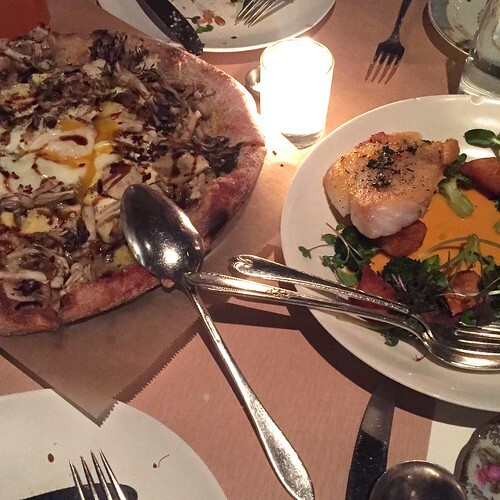 Another favorite from my last visit: the insane mushroom pizza with parmesan, oregano and a farm egg – completely meatless but very satisfying and perfectly presented, with a runny bright yellow yolk and crispy, charred crust. We also ordered the roasted hake with crispy potatoes, broccoli and red chile garlic sauce, which was super delicate and fell apart with a fork and had a nice kick thanks to the sauce. All in all, a really lovely and light low-key meal in a beautiful venue. You are currently reading ABC Kitchen at Notes on Food.